When visiting a home, one should remember that it is considered impolite to arrive early; one should arrive on time or about 15 minutes late. Bringing a small present, such as a bottle of good, expensive wine, a box of chocolates, or flowers, is appropriate. The French never take their shoes off inside, and it would be inappropriate to do so. If dinner preparation is still in progress upon your arrival, it is considered good manners to offer help with cooking and setting the table. During the meal, always wait to be offered second helpings by the host or hostess. After the meal, one should at least attempt to clear the plates or help clear off the whole table. A dinner party usually lasts around three hours and ends with coffee or tea. 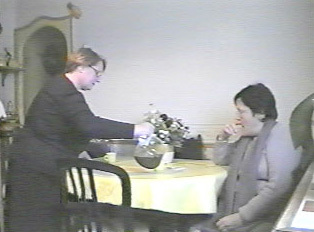 After the final beverage is served, the guest may suggest that it is time to leave; certainly by 11 p.m. guests should be preparing to go. "I'm Having Dinner at My Friends' Place"
"We're Thinking About Stopping By"